For many residents in Piedmont, spiders can be wonderful allies to have when it comes to protecting a home from unwanted insects flying into your home; however, they can also become a scary nuisance when they’re found creeping on the walls of your home’s interior. As the seasons begin to change from summer to fall, spiders will definitely continue lingering around the home. With the cooler days setting in September and October, spiders will begin seeking the warmth that the inside of your home provides. But fear not! There are some effective ways to keep spiders out of your home this fall, which we will look at in today’s blog post. Essential oils have many wonderful uses, but they work especially well when used to fend off spiders. Essential oils like peppermint, rose, tea tree, eucalyptus, and of course, citronella, are all great spider deterrents. If you’re looking to get spiders out, rather than killing them, essential oils are an effective, natural alternative to toxic, chemically-based pesticides and bug sprays. Simply fill a water bottle with water and add 20 drops of essential oil, and spray the spaces throughout your home where spiders like to hang out. Go back around and re-spray as needed. You’ll notice fewer spiders and your home will smell amazing. It’s a win/win. Spiders will find any holes or spaces to crawl in through if left unsealed. 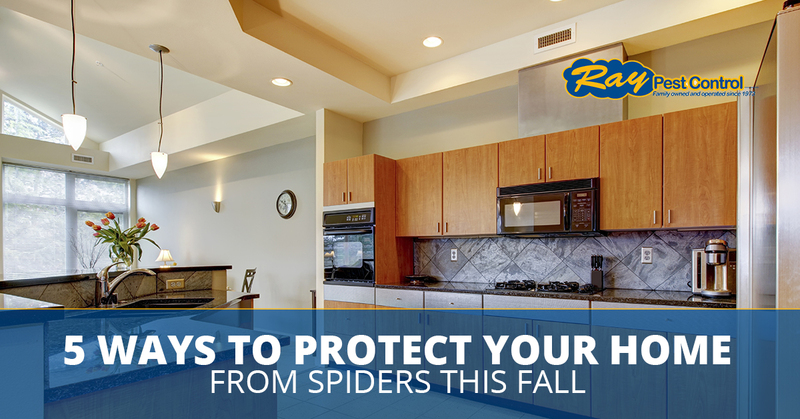 Patch up cracks, holes, and spaces to prevent spiders from making their way into your home. Use caulk to fill in spaces around doors and windows, electrical components, and other gaps around the home. Fixing or replacing torn screens, or those that don’t fit into the window correctly, will also prevent spiders from getting in. For added protection, purchase a roll of screen material or fine mesh to add to windows. As an added pest control method, you can even put a layer of mesh beneath vent covers to help protect against spiders. For many folks, keeping exterior lights on around the house provides peace of mind, yet these lights also attract a variety of bugs seeking heat, which in turn, attracts hungry spiders. Turn off the exterior lights when they aren’t needed, which will essentially be like shutting down the all-you-can-eat buffet for spiders. This will reduce the chance of spiders sneaking in an open door or window. It’s easy for clutter to build up around the house during the summer when you’re off enjoying the great outdoors. But by the time fall rolls around, you’ll have a small spider neighborhood in that pile of clutter, especially those in garages, closets, and spare rooms that don’t get used as much. Try to avoid letting clutter collect around the home. That way, you won’t have a spider jump out at you from a pile of boxes that have been sitting on the floor for months. While these are all simple, natural ways to keep spiders out of the home this fall, it is often best left to the professionals. If the spiders in your home are simply too much to handle on your own, call Ray Pest Control, Piedmont’s Top Rated Local® pest control experts. We’ll eliminate the spider problem from your home safely and efficiently. Contact us today to get a free pest control service quote.